Vicoprofen addiction may occur even when your loved one were using it for a very short time. Currently, doctors prescribe it to treat severe pain. Hydrocodone: This is a narcotic or opioid painkiller that alters the way your brain receives and processes the pain signals. Ibuprofen: It is a Non-steroidal anti-inflammatory drug (NSAID) that eases pain and swelling in the body. Hydrocodone is addictive but not ibuprofen. Nevertheless, the latter can also harm your health if you overdose on it. For example, it may cause bleeding in the stomach, easy bruising and breathing difficulties. They may make a powder from the tablet and snort it. Taking it along with another prescription, illegal drug, or alcohol. Injecting or chewing the tablet to get a rapid and more intense high. Vicoprofen can become addictive even when they follow the doctor’s instruction during the therapy. In fact, this is where you need to take special care. That way, you will be able to sense even the slightest of the hints indicative of an addiction. What Are The Signs and Symptoms of Vicoprofen addiction? 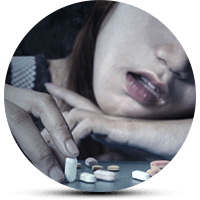 Vicoprofen addiction causes a wide range of physical, psychological, behavioral, and financial problems. While some of them may be too obvious, you may miss the others. Notably, doctors do not prescribe Vicoprofen for more than 10 days. Therefore, you should look for the signs during the first week after they start taking it. Let’s say the signs persist for more than that. Then, there is a chance that your loved ones may have developed an addiction. This is due to the time frame for when the doctor prescribed it. Nonetheless, you should keep your senses alert to detect even the slightest hint of it. Psychological signs: It is a powerful medication that affects how your brain processes the signals. In addition, an addiction may also affect the brain’s structure. This can lead to a number of noticeable psychological symptoms. They can include aggressive behavior, severe mood changes, and problems with memory and focus. Physical signs: Eventually, the physical effects of Vicoprofen addiction set in and cause even more problems. You may notice changes in appearance, weight, food habits, and skin. What’s more striking is all these do not seem natural. Behavioral changes: In the same way, Vicoprofen may affect how you loved one behaves and maintains social interactions. They may avoid communication and prefer isolation. This (previously not seen) behavioral change could be a strong predictor of an addiction. The signs of Vicoprofen addiction mentioned above may not all be present in your loved one. This is because addiction affects different individuals in different ways. Therefore, you should observe all the signs closely. In addition, use your judgment before making a confirmation of the addiction. If you sense anything abnormal, seek immediate help from an addiction counselor. That way, they will most probably be able to free themselves from the addiction. Additionally, it can also reduce the chances of a relapse. Increased risk of overdose: Taking a large dose of Vicoprofen to get an intense high can lead to overdose symptoms. They include slowed or stoppage of breathing, convulsions, and coma. Seek emergency medical help if you think someone has overdosed on it. Fatal injury due to accidents: It can impair concentration and also cause slowed response. Such effects are particularly more dangerous when driving a vehicle or operating a machine. Possible involvement in criminal activities: There are very few evidence of a Vicoprofen-induced crime. However, one cannot ignore the fact that the risk is always higher during a trip. Legal problems: Using it without a doctor’s prescription is illegal. Likewise, sharing it with other is again an act liable to be punishable by the law. Economic downfall: The amount of time and finances used to fund the increasing need for the drug severely impacts their financial status. Gateway for heroin addiction: They discovered that a significant portion of heroin addicts to have started the dreadful journey with Vicoprofen. This is according to a report by National Institute on Drug Abuse (NIDA). The risk of death due to combined drug use: They may combine it with other drugs or alcohol. This is a potentially life-threatening practice. Of course, you should not miss any sign to avoid such scenario. This is considering the degree to which Vicoprofen addiction can be dangerous. Quite understandably, you should take measure possible to detect it at the earliest. Try to identify and treat it as soon as possible. This will increase the likelihood of a complete and faster recovery. Do you think someone you love has an addiction? You should talk an addiction counselor. They can teach you ways to deal with the cravings, prevent relapses. Finally, the addict will be on their way to a full recovery. Looking for professional medical help for a Vicoprofen addiction? Get the best rehabs page here.